A writer friend comments that she doesn’t believe many writers consider their ultimate readers when writing a story. She went on to say that most writers she knows spend all their time perfecting the beginning and not as much to the ending. The next day I received an email from a disappointed agent friend who had just finished reading a manuscript she was SO hopeful for and realized “at the last 60 pages or so there must be a book in there, somewhere,” but not in the shape she needs it to be. Both of these comments led me to consider the beginnings and endings of every creative effort. How many of us do endings well? Not just with our stories but in other aspects of our lives, too. Ending a relationship. The end of a visit. Finishing anything. I remember when when I was young how impatient I’d become to finish a sewing project. Toward the end, putting in a zipper or hemming, I’d let things slip, eager to be done so I could wear my creation. Instead, I’d be admonished to rip and do it again, and again, until the final creation was perfect. Or, perhaps, you’re simply not ready to let go. Over the months, or years, of writing, you’ve established a meaningful relationship with your characters and your story, so you dawdle in the red-hot beginning and turn away from the messy end. Either way, rather than write the beginning of your story 10,000 times, or should I say along with all those rewrites of the beginning, don’t forget to dedicate the same sort of attention to the ending and fulfill your promise to your readers. Say you’re an artist. You tell your friends about your vision or show them what you’re working on. They’re hooked and eager to see the finished piece. You perfect the nose before moving on to the lips. Then you find the two features don’t work with the rest of the face. You apply more paint. The parts don’t blend together into a satisfying whole. So you go back to the nose and apply more paint. Eventually you’re staring at a muddied canvas. Try starting at the end and working your way to the beginning. Sketch the piece until you’re satisfied. Then start painting. Imagine how the character transforms and what the action she takes at the end of your story, the middle, and then at the end again. Then start writing. Paint and write and whatever else that makes up your creative life in drafts and layers all the way from beginning to end before going back and starting again. To help with this common practice and jolt writers into giving the ending it deserves, I always begin a plot workshop, consultation, presentation at the Climax. 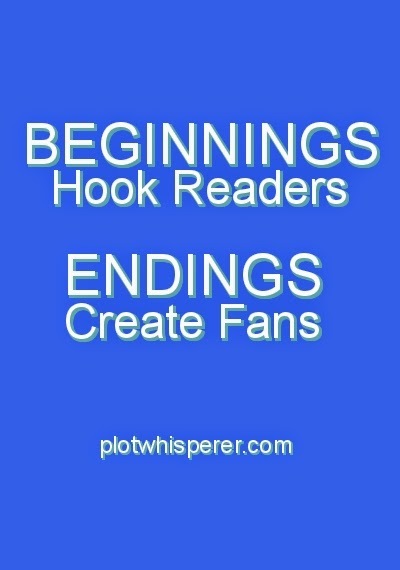 Need more help with the beginnings and endings of your story? 27-Step Tutorial: How Do I Plot My Novel, Memoir, Screenplay?